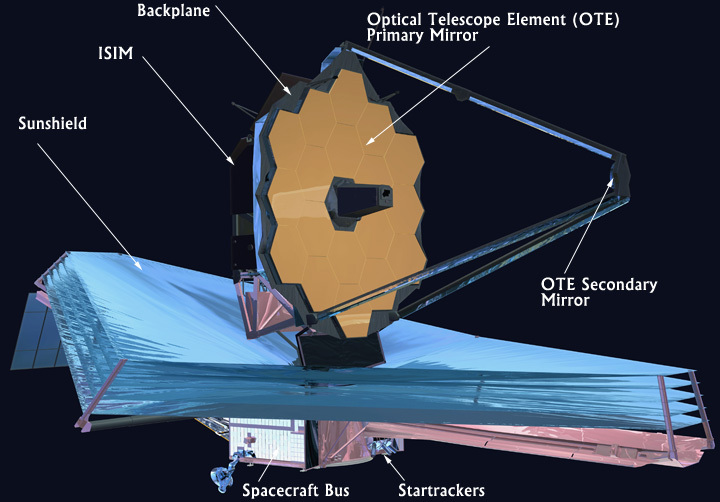 Schematic of JWST. The large sunshield (blue) blocks radiation from the Sun, Earth, and Moon from reaching the science instruments in the ISIM (Integrated Science Instrument Module). Image from NASA. An artist's conception of JWST folded and ready for launch aboard an Ariane 5 rocket. Image from Arianespace/ESA/NASA. The 6.5 meter James Webb Space Telescope (named for former Apollo-era NASA Administrator James Webb) is scheduled to be launched from the Ariane 5 launch site in French Guiana in 2014. Unlike Hubble, which is in Earth orbit, JWST will orbit around the Earth-Sun L2 Lagrange point. The decision to send JWST to L2 was motivated by the need to cool the spacecraft in order to conduct observations in the infrared. Although parts of JWST are actively cooled, the remainder of the spacecraft will be passively cooled by placing the spacecraft in deep space and deploying a tennis court sized shield to block light from the Sun, Earth, and Moon. Size comparison of JWST's 6.5 m diameter primary mirror to Hubble's 2.4 m diameter mirror. Graphic from NASA. Due to their large size, the sunshield and the primary mirror of the telescope will be folded to fit inside the payload compartment of the Ariane 5 ECA launch vehicle. 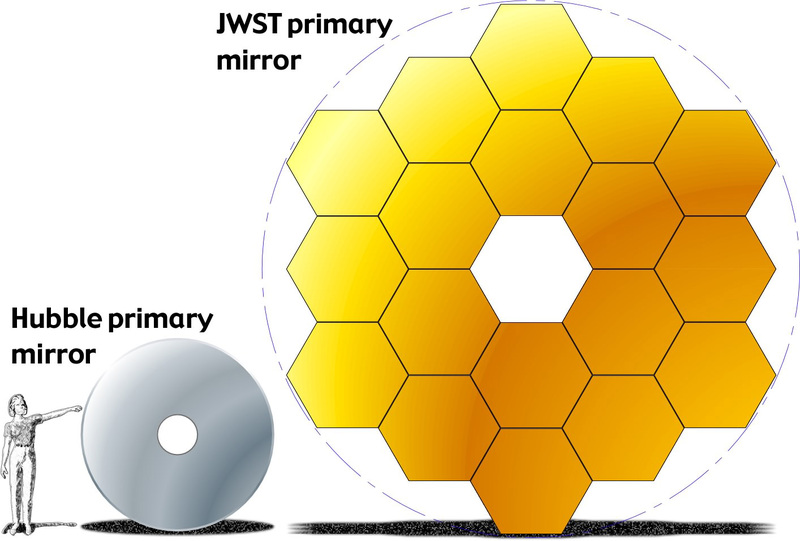 The figure on the right compares the JWST’s large primary mirror to Hubble’s 2.4 m mirror and the figure on the far right displays JWST in launch configuration. After launch, the telescope mirror will magically unfold and the solar panels will be deployed as shown in the deployment animation below. As the name suggests, MIRI is sensitive to mid-infrared wavelengths between 5 and 27 micrometers (or 29 micrometers for spectroscopy). MIRI will be actively cooled to 7K and used for wide-field broadband imagery and medium-resolution spectroscopy. More information about MIRI is available from the University of Arizona and the Space Telescope Science Institute. NIRCam serves the dual role of acquiring high angular resolution images at 0.6-5 microns over a 2.2’x2.2′ field of view and conducting wavefront sensing using the Optical Telescope Element wavefront sensor. Although JWST will not have to contend with the Earth’s atmosphere, minor differences in the shape and position of the primary mirror segments could introduce disortions and phase variations in the wavefronts received by each segment. The Optical Telescope Element wavefront sensor will be used to monitor such distortions and reshape and realign the mirror segments to correct the wavefront errors. For science observations, NIRCam will be operated in one of three imaging modes (survey, small source, or coronagraphic) or in medium-resolution spectroscopy mode. More information about the NIRCam imaging modes and filters is available from the Space Telescope Science Institute. NIRSpec will use a “microshutter array” to acquire simultaneous 0.6-5 micron spectra of 100 objects over a 3’x3′ field of view. 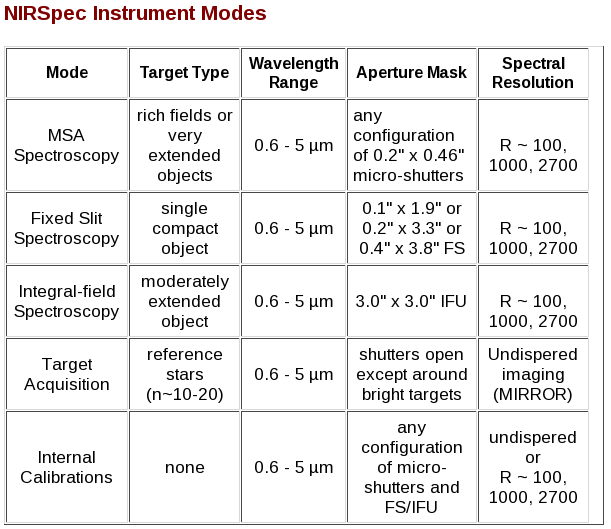 In addition to the novel “Micro-Shutter Assembly” (MSA) mode, NIRSpec may also be operated in Fixed Slit mode or Integral Field Unit mode with the spectral resolutions shown the following table from STSCI. Description of NIRSpec Instrument Modes from the Space Telescope Science Institute. The Fine Guidance Sensor component of FGS-TFI consists of a 1-5 micron broadband guide camera capable of finding a guide star at 95% probability anywhere in the sky. FGS will be used to monitor JWST’s pointing throughout the mission and to properly deploy the primary mirror during the unfolding phase of the mission. The second half of FGS-TFI, the Tunable Filter Imager is a science instrument that will be used to acquire narrow-band images between 1.6-4.9 micrometers at R~100 resolution over a wide 2.2’x2.2′ field of view. TFI is being built by the Canadian Space Agency.